English, Hindi, Marathi, Gujarathi, Arabic. 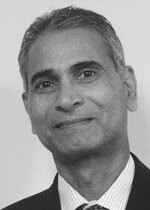 Mr Krishna is a Consultant Urologist at the Royal Surrey County Hospital and has worked in the Department of Urology for 15 years. Prior to that, he was a Consultant Urologist in Saudi Arabia. (remove sentence) He is an experienced open, laparascopic and robotic surgeon who has recently undertaken fellowships in modern surgical techniques in both Michigan, USA and Leipzig, Germany. Mr Patil has published in a variety of publications over the last 20 years. Mr Krishna Patil does not hold a share or financial interest in this hospital, another Nuffield Health hospital or the company. Mr Krishna Patil does not have a share or financial interest in equipment used at this hospital or another Nuffield Health hospital. Mr Krishna Patil does not hold any paid advisory role(s) at this hospital or on behalf of Nuffield Health.